﻿ News Bharati - Ladakh region in J & K sees ‘light of the nights’ 72 years after independence! News Bharati - Ladakh region in J & K sees ‘light of the nights’ 72 years after independence! Ladakh region in J & K sees ‘light of the nights’ 72 years after independence! Jammu, Feb 7: They lived in dark, braving the chill of the snowy nights for 72 years after India became free. It took the people of Ladakh region Jammu and Kashmir State to see the “light of the nights” a long wait of 72 years. Thanks to Narendra Modi government the people of Ladakh region now have access to electricity 24 hours a day. Under Prime Minister Narendra Modi’s dream project of One Nation-One Grid Scheme, this region is now connected to the National Electricity Network. Now the Ladakh region will be able to spend electricity according to its requirement. This is like a boon for Leh-Kargil-Drass areas of this region where the power can be provided twenty-four hours or even in the minus 35-degree temperature. Power Grid tweeted, “Ladakh successfully connected to Kashmir with the 220kV transmission system. JKPDD & POWERGRID test charged 220kV Alusteng-Dras-Kargil-Khalsti-Leh TL along with 220/66kV S/s at Dras, Kargil, Khalsti & Leh. Ladakh will get power in winters & surplus power will be evacuated in summers”. Ladakh successfully connected to Kashmir with a 220kV transmission system. JKPDD & POWERGRID test charged 220kV Alusteng-Dras-Kargil-Khalsti-Leh TL along with 220/66kV S/s at Dras, Kargil, Khalsti & Leh. Ladakh will get power in winters & surplus power will be evacuated in summers. Earlier, in the freezing cold, the people had to complete the electricity consumption through generators. It is a very expensive and polluting deal, which consumes millions of litres of diesel. Before this, electricity was generated through NHPC hydro-power projects in this area. Apart from this, power generation was also done through solar power projects but about 95 per cent of the area was struggling with electricity shortages. Now these problems will be solved through this connected power grid and uninterrupted power supply will vastly improve the quality of life in Leh and Kargil, which have been power deficit due to their isolated locations. “This is a milestone for our country. We have now connected our northernmost areas to the national grid. It is a milestone for the people of Ladakh and Kargil. Prime Minister Narendra Modi laid the foundation stone on August 12, 2014, and it was commissioned during this government tenure. This is a commitment to people’s welfare,” power minister RK Singh said. In a significant milestone, Ladakh has been connected to the National Grid, after 70 years of Independence. 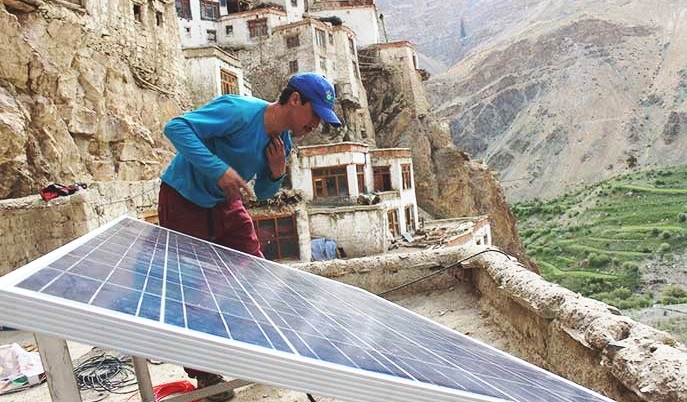 Now people of Ladakh will be able to access as much power as they need. This electrification will also help the Indian Military in the high altitude posts. One of the major achievements also includes construction of sub power stations in a few high altitude passes and military zones close to LoC.